Sango Safari Camp in Botswana's Moremi Game Reserve accommodates guests in secluded tents and offers superb game viewing safaris. Situated in the Moremi Game Reserve and shaded by trees, the Sango Safari Camp is the ideal Botswana safari accommodation for those seeking a place to experience the wildlife and culture of the Okavango Delta. 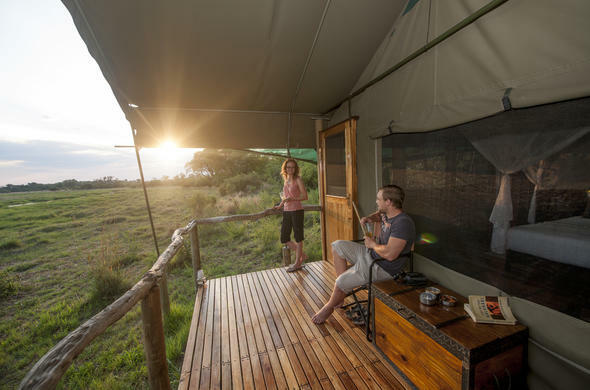 Guests at this Botswana safari camp will be accommodated in one of 6 exclusive meru tents in the Moremi Game Reserve. The tents at the Sango Safari Camp have unique amenities that contribute to the rustic but luxurious ambiance. Game viewing and cultural experiences are the focus of this Moremi Game Reserve safari. Track an infinite number of wildlife on your game excursions through the reserve. Spot the predators as they lurk their prey in action-packed night drives.